← Is Eye Wrinkle Cream Important? Posted on February 25, 2012 by Katerina S.
Main selling point: Revitol Anti-Aging Cream now comes in a new all-in-one formula for younger looking skin for women and men. Why we chose to review Revitol Anti-Aging Cream: In late 2011, Revitol changed its famous anti-aging solution from three a product kit into a one product solution, and we were interested to find if the new all-in-one product is an improvement on the original product. What is the biggest improvement? Do the new ingredients help to firm, hydrate, and tighten facial skin and reduce the appearance of fine lines and wrinkles? What do Revitol users say? And is this natural anti-aging product suitable for everyone? We answer these questions and more in this Revitol review. 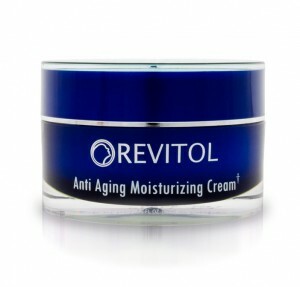 Instead of three products for one solution, now Revitol anti-aging cream comes in one jar. This new anti-aging product is still made using natural ingredients in a proprietary blend containing: Matrixyl, Hyaluronic Acid, Hydrolyzed Wheat Gluten, Ceratonia Siliqua, Macrocystis Pyrifera, Edelweis Extract, Shea Butter, Squalene, Evening Primrose Oil, Skin Tightener ST, and Pentacare NA. Many of these ingredients are familiar to us, and are generally what healthy skin should contain to retain elasticity, smoothness, hydration, firmness and even skin tone. You can view the full list of Revitol ingredients here. The new Revitol solution has an increased quantity of Argireline, which is said to boost effectiveness of the product’s ability to reduce fine lines and wrinkles. Argireline is known to be absorbed quickly and to relax skin naturally. And it is believed to reduce fine lines from appearing due to tension in facial muscle. Revitol has been reported to have a powerful rejuvenating effect on skin; however for this product to work effectively, it is essential that the solution be applied correctly. From the user testimonials we reviewed, there were some complaints regarding Revitol’s effectiveness on crow’s feet, with a few product users claiming they were not fully satisfied. Yet conversely, this same product received strong applaud for getting great results on reducing fine facial lines, and especially the laughing lines around the mouth. Revitol recommend their anti-aging solution not be applied on eye area at all. We advise users to follow this official recommendation and take caution to avoid applying Revitol to the eye area. As with many skincare products, not every user was pleased with their results. Our reports analyse results reported from various user reviews, attempting to identify which products work best with each skin type. Our research indicated that new Revitol users, who had been using other anti-aging products for a long time, were more likely to be dissatisfied when trying Revitol. Some reported they didn’t see results after a full month of applying the product. A couple claimed they felt some tightness in their skin, but visibility of the wrinkles did not significantly improve. On the other hand, outstanding reduction of fine lines and wrinkles were reported by many women under 40. They reported being happy about their skin tightening, and said they felt significantly improved hydration, increased elasticity, bounce and texture. Men in this same age group reported similar experiences. It’s probably no surprise this all-natural anti-aging product doesn’t yield hard-core results on deep wrinkles, as typically seen with Botox injections. Testimonials and user reviews indicate this product may be more effective for users below 40 years of age. Male users under 40 were also generally satisfied with the product. We believe this trend may be due to better absorption of the product on younger skin. Revitol’s natural ingredients are gentle on the skin and the fragrance is pleasant. Overall the reports on this product have been somewhat of a “mixed bag” and we suggest those who wish to try Revitol do so by taking the 90 day risk-free trial, and see how it goes. We hope you have found this Revitol Anti-Aging Cream Review useful and helpful in making an informed purchase decision. This entry was posted in Revitol, Wrinkle Cream Reviews. Bookmark the permalink.